Amazon sells BlackBerry Curve 8520 for a penny | BlackBerry Blast! 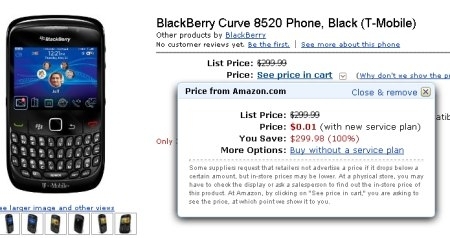 Amazon is really dropping the price of the BlackBerry Curve 8520 to a price that is hard to refuse. The online retailer is selling the 8520 for $.01. That's right, 1 cent. You'll have to sign up for a 2-year contract with T-Mobile to get the 1 cent deal but it's worth it. Walmart recently advertised this phone for what seemed to be a ridiculously low price of $48.88. Check out the full story link below to head over to Amazon to get your BB 8520.